On Thursday, the remaining 12 GOP candidates will go head to head for the sixth time in a debate hosted by Fox Business Network. Neil Cavuto and Maria Bartiromo will question the primetime debaters in North Charleston, South Carolina, with a focus on economic, domestic, and international policy. Once again, the lower ranked candidates will appear in an earlier forum, moderated by Trish Regan and Sandra Smith. 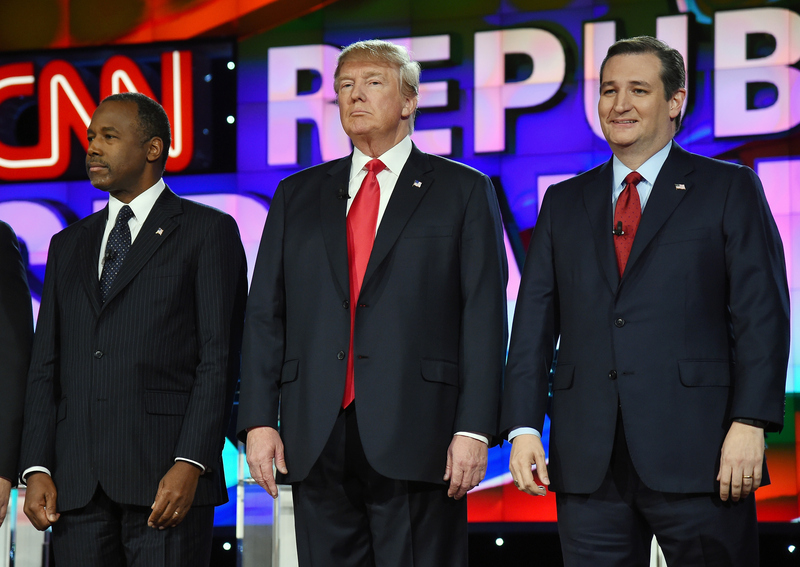 The Republican politicians are sure to bring up the hot-button topics they've debated since the race began, but there are a few important issues the GOP debate probably won't touch upon. The conservative candidates love talking about defeating ISIS, the Second Amendment, Hillary Clinton and President Obama's supposed failings, and protecting innocent fetuses (though that's come up less in the most recent debates). While they usually spend a good amount of debate time on those areas, they tend to ignore some issues that affect normal Americans on a daily basis. Of course, this is in part due to the questions they're asked by moderators, but the politicians also don't make a point to introduce the subjects themselves, even when they would easily relate to discussions about the economy or safety. Here are five issues the Republicans probably won't bring up at Thursday's debate, but are worth talking about. When debating how to build up a thriving economy and support workers, the Republicans talk about the minimum wage and creating jobs, but rarely mention paid family leave. As the only industrialized nation without guaranteed paid maternity leave, U.S. employers force many women to return to work right after giving birth or lose their jobs. In order to "make America great again," as Donald Trump claims he'll do, this issue that affects millions of families needs to be addressed. Although the Netflix documentary series Making a Murderer sparked a nationwide discussion about flaws in the criminal justice system and wrongfully convicted inmates, it's unlikely that the GOP debate will breach the subject. First of all, the candidates wouldn't want to comment on whether or not Steven Avery is innocent or guilty of the murder he's in prison for. However, it's possible to debate injustices within the system and how to fix them without focusing on Avery's case. The Wisconsin man was wrongfully convicted and exonerated for a sexual assault he didn't commit, so his 1985 case at least proves problems exist for accused criminals — problems that you probably won't hear about from the Republicans on Thursday. On Monday, oral arguments began for Friedrichs v. California Teachers Association in the Supreme Court. The case revolves around teachers who don't think they should be forced to pay fees to the union that bargains for them because the union doesn't necessarily match their political beliefs. If the union loses the case, teachers will benefit from its bargaining without supporting it financially, which could weaken the union over time. Labor unions generally support Democratic politicians, so the GOP isn't exactly rooting in their favor. The Supreme Court ruling will be important for the future of labor unions in the country, but don't expect the Republicans to explain why they want the union to fail. The Republicans have shied away from bringing up retirement so far in the 2016 election, but it's an economic issue that older voters already struggle with and younger voters will face at some point. Many of the candidates, including Marco Rubio and Jeb Bush, support making drastic changes to Social Security, and voters about to hit retirement age probably wouldn't be happy about plans to raise the retirement age or make it more difficult to get benefits. Past GOP debates have briefly mentioned the Black Lives Matter movement, but the candidates never discuss the movement or issues of racism in depth. Because they don't talk about race on the campaign trail either, it's unlikely that institutionalized racism or police violence against Americans of color will be a debate topic Thursday, despite the fact that many Americans deal with the negative consequences on a daily basis.